The Husband and I moved into this neighborhood in 1999. We were buying our first house; we were bringing to the transaction all the baggage a young couple sans children possibly could. Out the window, unrealistic dreams of two-story Queen Anne Victorians with turrets in need of love only we could give! On the table in front of us a sweet little frame bungalow with two bedrooms, one bath, and no closets to speak of. You get what you need. Just think how much time I would have had to spend cleaning that two-story Victorian (not to mention making it habitable)? Before the ink was even completely dry on the contract, when we were wrestling our futon (ah, glory days of youth!) through the front door, I stood on the front steps and surveyed what I saw. What was it all those home-buying how-to books had said about assessing the neighboring houses before you fell in love with a piece of real estate? Only at that moment did the scales fall from my eyes: not only was the house to one side of us a dilapidated rental, our neighbor across the street appeared to be running a wrecking yard complete with two tow-trucks out of his backyard. When we gave our parents the grand tour they were appropriately complimentary — and then they asked: what about the schools? We laughed, merrily, and continued trying to cram all our belongings into a closet narrower than a file folder. We didn’t even have kids! Who cared? Over the next few years, that neighbor would occassionally chase his teenaged son out onto their front yard to administer discipline with his fists. The dilapidated rental would change hands, be renovated out of being a duplex, and sell for more than we’d dreamed possible. I’d call the cops on a thief strolling up our other neighbor’s driveway with his lawn mower. We’d have one child, then be about to have another. Move six blocks down the street, of course! Which put us only four blocks away from the only City of Atlanta park in the neighborhood: a vest-pocket sized square of greenery littered with beer bottles and condoms. In the early 90s, that park had been carved from a vacant lot that was a homeless encampment. In 1999, when we attended our first neighborhood meeting, residents were already grumbling about the glassine baggies under the slide. By 2003, you never spotted a kid playing there. In 2005, the summer after we moved into our new house, I called our City Council representative to ask — would the City ever considering replacing the play structure there? Whatever possessed me? To this day, I have no clue. In 2006, things looked bleak: if we wanted a new play structure, we’d have to raise the money ourselves. In 2007, that City Councilperson got the City interested in our plight. During 2008, the funding for the renovation was touch-and-go. In 2009, the weather stopped cooperating. It’s hard to build a playground during the rainiest October and November in years! The (already rescheduled once) ribbon-cutting was finally held three weeks ago, on what was the coldest of the year so far. The contractor was still there finishing up at 6 pm the night before. Rain was forecast, then it wasn’t. Would it snow? Sixth graders from the charter middle school had made a paper chain long enough to wrap around the new structure. A neighborhood family who owns a coffee shop had donated coffee; we pitched in to pay for hot chocolate. 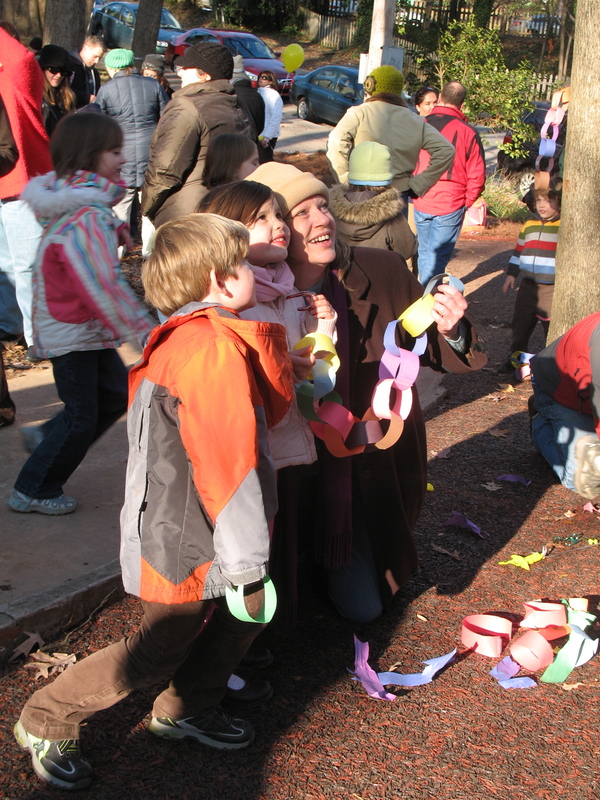 The sun came out; over eighty folks showed up to bust through the paper chain and break in the new structure. And then, day before yesterday, the Girleens and I walked down to our newly refurbished park. Look! Elder Girleen called to me with dismay right after we got there. She pointed at the ground beside the slide. How many times have I said to my children: if you see something on the ground at the park, never ever pick it up? Because here in the ‘hood, you hear stories: the kid who picked up a gun, the ditched bags of crack, you name it. My eldest daughter, well-taught, stood back from that cell phone lying the ground as if it were a snake. It turned out to belong to a parent who lives down the street. Elder Girleen could have picked it up, she could have, and if that doesn’t speak to change, I don’t know what does. The site is looking good.